The growth of smartphones has been phenomenal. With the entry of big players like HTC, Samsung and Apple the features of a smart phone have been getting frequent makeovers. Each of these companies wants to establish itself as a market leader. The single goal seems to be enhancing the smart phone features like processors for better processing, display, camera etc. There has been so much of development when it comes to both the design and performance of the smart phones. All this obviously comes at a cost. Better the phone, higher the price. The phone market had become top heavy. Those who can afford these super expensive phones get to use all the latest smart phones. India is an emerging market which on one hand has the affluent rich class and on the other has a huge middle class. There is a huge market that is ready to be tapped for good quality and affordable smart phones. A mobile phone now days has become more than an accessory, it is a necessity. Not everyone can afford smart phones worth thousands from Samsung or Apple. This is where a company like Micromax succeeds. Micromax is a Gurgaon based company which has been focused on manufacturing mobile phones and LED television sets. 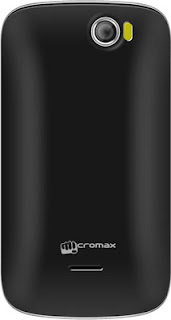 Micromax is the largest domestic mobile company in India. It has been gaining popularity as it has been able to penetrate the masses and sell smart phones to a larger audience. The biggest USP for Micromax is the fact that it is affordable. The company has launched products that sold well and helped it gain market share. One such smart phone that is aimed at the price sensitive end of the market is Micromax A65 or also known as Micromax Smarty. Micromax A65 is an entry level budget smart phone. The phone is priced around Rs.5000 in the Indian market. The phone comes in good packaging. When you open the box you will find all the accessories like User guide, Warranty card, Handset, Charger, Headset, Battery, Data Cable and a Protective Cover. The protective cover is a nice surprise. It seems thoughtful on the behalf of Micromax. Usually the cover has to be bought separately and one ends up spending extra on getting a mobile cover. The first impression of the phone is pretty good. It is an admirable looking device with slightly curved corners. It gives a rich look and at the first glance doesn't appear to be a budget phone. It is a dual SIM phone which will only be available in one color, black. The phone weighs 148 g and its dimensions are 69.7x130x10.95 mm. The screen size is a generous 4.3 inch which is pretty big for a budget smart phone. To top it up it is a capacitive multi- touch screen. The display is TFT with WVGA, 480 X 800 pixels resolution. It supports 267 K colors. The screen may not have the crisp quality of other high end smart phones but it is not a deal breaker. With a resolution of 480 X 800 spread over a 4.3 inch screen there is bound to be some pixilation. A 1 GHz ARM Cortex-A5 processor works well. It supports the apps and lets you play games. There is a lag and if you open multiple apps the processor cannot handle that. It gets the work done but nothing fancy. Micromax A65 has a 512 MB RAM. It runs on an old version of android operating system. It carries Ginger Bread 2.3.5. Now this again may not sound great but this too gets the work done. You can access various apps and Google play. The icons look a bit stuck and the flow is a bit jarred. But one cannot really complain about it at such a steal away price.It has microSD slot to expand the memory upto 32 GB but the internal memory is a too low at 190 MB. If the looks and price have not yet impressed you then you should look at the plethora of features that Micromax Smarty offers. It has 3.5 mm audio jack. The audios are decent and voice quality is good. The A65 also surprises us by having a primary camera of 2 MP as well as a secondary camera of 0.3 MP. Do not expect a lot from the pictures, they are as good as 2 MP camera can click. Since the phone does not support 3G, video calling is not an option but you can use skype or any other similar application to do video calls. Pictures taken in full day light come out well but the camera does not really work in dim light or in the night even with a flash. The phone offers connectivity via Bluetooth, WAP, wifi, EDGE and a class 12 GPRS. The media player supports both MP3 and MP4 media files. Micromax has also ensured that there is a FM. For gamers there are proximity and gravity sensors built in. You can comfortably play basic games including temple run but otherwise the graphics are not pro gaming. The phone comes loaded with apps like WhatsApp, Hookup, Facebook, Mi Zone+, M live, Cricket Fever, Google Play Store, Mi Store and other Pre-loaded Apps. For such a loaded smart phone the battery does not do justice. Micromax A65 has a Li-Ion 1350 mAh battery. The battery supports 5 hours of talk time but drains when you play games or access other interactive apps. It’s a safe option to carry a charger along just in case the need arises. Micromax Smarty A65 is a great entry level smart phone. The specs are decent and the audio and video quality is acceptable. The operating system and processor work well together and at such a price point don’t give you a chance to complain. If you are comfortable shelling out a few more thousands then there are much better smart phone available in the market. Micromax A65 is not the best phone in the market but for a budget smart phone which has good looks, 4.3 inch screen and comes loaded with a host of features this one gets thumbs up. The Author of this post is Julia. She wrote several tech posts for 91mobiles.com. 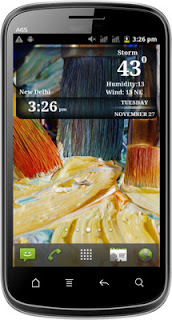 Also check out micromax a65 price in india here. Her passion for upgrading her knowledge puts her to research on topics relevant to her industry. Besides, she also likes to share her findings by writing about them in her free time.